Since its founding, KKDE has self-produced numerous home seasons in Oakland, as well as producing concerts and collaborations in San Francisco. Artistic Director Barnes has worked in collaboration with dancers, musicians, and poets in order to realize her vision. KKDE has toured throughout Southern and Northern California and in Salvador, Bahia Brazil, and performed in several Bay Area dance festivals, including the East Bay Dance Series, Oakland Arts Festival, WestWave Dance Festival, Black Choreographers Festival, and ODC’s Pilot and House Special. Barnes is also an alum of the Artist in Residency program at Headlands Center for the Arts and at CounterPULSE/SF. With these critical resources and the mentorship of Rhodessa Jones of Cultural Odyssey, Barnes developed Home Is That Way?! 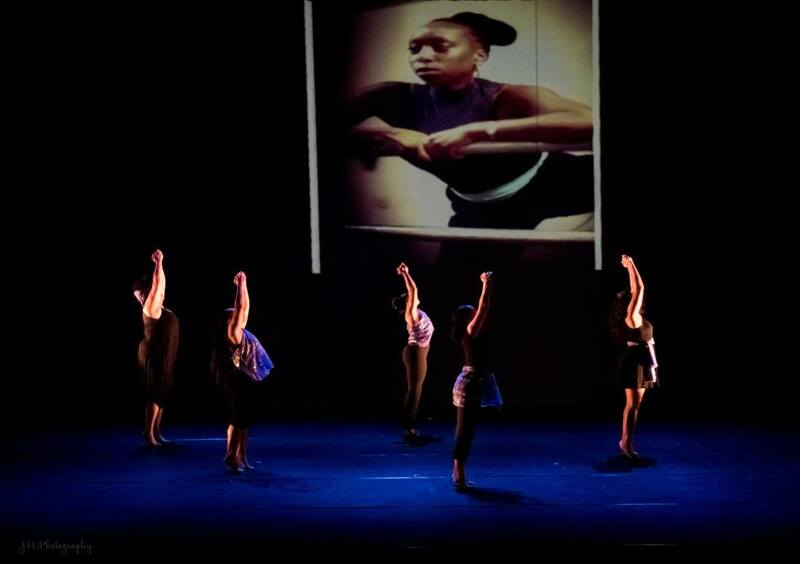 (2010), a dance-drama exploring the effects of the incarceration of a loved one on a family. KKDE creates socially conscious works most recently including In The Meantime, a dance-drama about breast cancer prevention and awareness as well as ANGST: 3 AM which intimately looks at anxiety in and among African American boys, during their self-identity formation, and how it affects the relationships within their families and the community - both in creative collaboration with Delina Patrice Brooks. ​​has studied Contemporary, African, Brazilian, Indian, Dunham & Horton Techniques. She has performed with the late Malonga Casquelourd’s Fua Dia Congo, Chitresh Das’ Chhandam School of Kathak Dance, and Carlos Aceituno as well as projects with Donald Byrd, Robert Moses, Bebe Miller, Bill T. Jones, and Rosangela Silvestre. In 1996 she founded the Kendra Kimbrough Dance Ensemble (KKDE). Most recent works include notable dance-dramas: Home Is That Way?, with the mentorship of Rhodessa Jones, In The Meantime, and Angst in collaboration with Delina Patrice Brooks. In The Meantime was the 2017 recipient of PUSHfest Audience Choice Award for Best Choreography. Currently Ms. Barnes is collaborating with Oakland veteran vocalist Jennifer Johns on ReD zONE, a work dedicated to the ritual of healing from sexual assault. She has been a guest choreographer for San Francisco State University Dance Department, Dimensions Extensions Youth Performance Ensemble, Move Dance Theater of Oakland, and Abundant Life Christian Fellowship (staging a 100+ cast for a 4,000+ audience). KKDE has presented work at the East Bay Dance Festival, Alice Arts Center, the Black Choreographers Festival, Summerfest/WestWave Dance Festival, ODC Pilot, PUSHfest and Dance Mosaic. Barnes has taught dance to adults and children of all ages through Dimension’s Rites of Passage program in Oakland at the Malonga Casquelourd Center for the Arts and jazz, Pilates and yoga at San Mateo, Laney and SF City Colleges. She has been an artist in residence at the Headlands Center for the Arts and CounterPULSE. Her work as co-choreographer (with Latanya d Tigner) for CalShakes’ Black Odyssey was a finalist for the Theater Bay Area Best Choreography Award and she was the 2018 recipient of a Broadway World award for Best Choreography as Choreographer for the African American Shakespeare Company’s production of Ntozake Shange’s For Colored Girls Who Have Considered Suicide / When the Rainbow Is Enuf. She is excited to return to AASC as the current choreographer of their production of Black Eagles. Jennifer Johns is a siren, a call to worship, the horns before battle, your spirit’s amplifier. Vacillating between soul, hip hop, afro beat, dancehall, reggae, deep house and all rhythms in between, this sultry powerhouse produces sounds and experiences that are sure to stir your soul, inspire your mind and move your body. Jennifer has taken her global movement music around the world rocking stages from Denver to Dusseldorf, Los Angeles to London, Kuala Lumpur to Kampala ­ opening for some of the best in the business including the likes of Ms. Lauryn Hill, The Black Eyed Peas, Mos Def, Capelton, Ziggy Marley, Gil Scott Heron, Wyclef, Bebel Gilberto, Les Nubian, MeShell Ndegeocell, De La Soul and Common to name just a few. Today, Jennifer Johns is in the midst of creating a new body of work. Borrowing from all manner of “Afro Diasporic” sounds and rhythms, her lyrics span topics of love, power, freedom and fun..... stay tuned! is an artist, activist, and academic who continually melds her training in these worlds through interdisciplinary works. She earned her BA in Dance, Sociology, and Ethics from Loyola Marymount University in Los Angeles, MS in Bioethics from Columbia University, and is currently pursing a PhD in Sociology at University of California San Francisco. As a primarily-movement based artist with diverse training and experience, she has worked with artists such as: Ronnie Reddick, Joya Powell/MOPDC, Raissa Simpson/PUSH Dance Company, Alexandra Pirici, RAWdance, Urban Bush Women (Summer Leadership Institute), Holly Johnston, and dNaga Dance. This has manifested in a variety of forms, including dance films, site-specific works, installations, concert dance, and more, which informs her own practices as a teacher and choreographer/director. To learn more about her or her work, visit www.jhiajackson.com. Paige Mayes Paige Mayes is a actor/dancer/vocalist/entrepreneur. Whom is beyond grateful to make her debut in The Black Choreographers Festival along with an amazing group of dancers. Ms. Paige is a proud Aurora, Colorado native. She holds a BFA in Dance Performing Arts from Arizona State University. She was last seen in The Tenderloin Tour (Cutting Ball Theater), and The Broadway World Regional Award-Winning Production of For Colored Girls.... (African American Shakespeare Company). She sends much thanks to Kendra, for allowing her this opportunity and bringing social awareness, to such deeply rooted topics through this form of expression. Cria Merchant Cria Merchant is a native of San Francisco where she began her dance training with the San Francisco Arts Education in elementary school. A graduate of School of the Arts High School in San Francisco, Cria has performed with Bay Area artists; Robert Henry Johnson, pearl ubungen and Delina Brooks. She received her BFA from the State University of New York at Purchase in Dance and Performance. ​While in New York she was a member of Doug Varone and Dancers and the Kevin Wynn Collection. In 2008 Cria received her Masters in Counseling Psychology with a focus in Community Mental Health from the California Institute of Integral Studies. Where she continues her work as a therapist in Oakland. Cria is thankful to have the opportunity to continue exploring movement and creative expression with such brilliant artists. She would like to thank Kendra for her ongoing commitment to bringing awareness to topics that are often left unspoken. ​Linda Steele II is a improvisational dance artist and creator, formally trained at Marin Ballet and Marin School of the Arts before receiving her BFA from Alonzo King LINES Ballet/Dominican University of CA where she also studied Art History. She has been honored to have performed original works by Alonzo King, Drew Jacoby, Maurya Kerr's tinypistol, Sidra Bell, Katie Faulkner and recently with Joslynn Mathis Reed, Urban Jazz Dance Company, Dazaun Soleyn, Mud Water Theater, El Wah Dance Theater, Casey Thorne's Inside Out Contemporary Ballet, among others. Linda II has presented her work in dance festivals and art events including the renowned Ebony Fashion Fair. She has studied and choreographed Dance for Filmwith MADE in France and has performed internationally with Anandha Ray's Quimera Tribe, Corina Kinnear and others. She is deeply grateful to have met and collaborated with such amazing artists. Patricia OngIn 2014, she performed in Maseg, presented by Kularts (http://kularts.org/wp/) at the Brava Theater in SF, choreographed by Jay Loyola and directed by Alleluia Panis. Currently, she also performs with Paragal Dance Company (http://www.parangal.org/) and is thrilled to be invited to dance at the Merrie Monarch Festival in Hilo in Spring 2017. She’d like to thank her family for their loving support, especially her daughter, Kawayan who patiently sits through rehearsals and her parents who travelled a great distance to see her perform. Patricia has also performed with KKDE in "Angst", "In The Meantime", and "Revival".